Back in December 1994 my friend, Linda McReyonlds, got married and moved out of state. 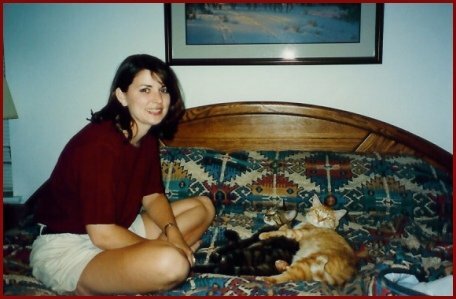 Before she moved away, Linda wanted me to get my cat, "Tiger", a female feline friend and to name her "Linda". I had had Tiger for about a year at that point. I picked out "Linda" at the Oak Cliff animal shelter on December 31, 1994. They spayed her and released her to me on January 4, 1995. "Linda" was approximately 5 months old when I got her. She was a very striking kitty - with the most beautiful markings I had ever seen on a cat. And I've seen a lot of cats! When she walked her tail was bend forward, almost dangling above her head. And the very tip of the tail was broken, so it had an endearing downward crook at the end. She was either born with her tail like that or a drama occurred during the 5 months before I got her. Linda had a small frame. Even though she was a hair overweight in adulthood (until her health declined) she still looked like a petite little girl. Linda and Tiger hit it off right away. They were buddies for 14 years, and for the first 10 years they were the only kitties I had - so they became very close. The two of them played together and groomed each other all the time. It was heartwarming to watch. Linda was a vocal kitty who would let me know when she needed a little loving. She so enjoyed me petting her. If I gave her moist cat food (instead of her normal dry) she'd gobble it up and then get on a cat house or a bed and cry until I came in there to love on her. I think it was her way of "thanking" me for the treat. She nearly always said "goodbye" to me at my front door as I left for work - I just had to say that "I'm going to work" and Linda would meet me at the door knowing she was going to get petted. She slept on the bed with me, near my right shoulder. Always near my right shoulder. Linda, like many kitties, didn't care much for strangers and would hide under a bed when guests were over. If I'm in the house, she would let my friend Nancy pet her - but other than that I was her only human contact. Linda was eventually diagnosed with chronic renal failure, anemia and high blood pressure - but you would never had known it. She seemed just as affectionate & bright-eyed and just as into our routines as ever. But she was losing weight. And as I tried to find foods that were better for her renal failure, her appetite suddenly plumeted. My vet discovered large amounts of fluid in Linda's chest and abdomen. The chest fluid was compressing Linda's lungs making it harder to breath. And that induced lethargy and anorexia. After many tests, the experts (including veterinarians and radiologists) determined that Linda had lymphoma. Despite our best efforts to clear her chest and make her feel better, Linda's lethargy, labored breathing and lack of appetite worsened. I put her down on February 15, 2010. For more information on Linda's health during her last few weeks scroll down below the pictures and video clips. I sure miss this special little gal. Below are some pictures of Linda, followed by several short video clips. When I first brought Linda home, I kept her in the guest bedroom for two days with a screen door separating her from the hallway. 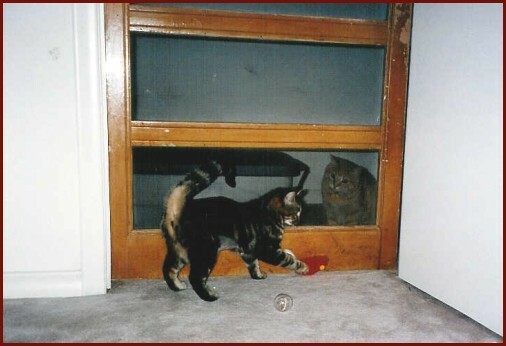 The theory was that Tiger and Linda would slowly get to know one another through the screen door and that by the second day their curiosity about each other would be elevated - which would increase the odds that they would become friends. It worked! Just a couple of days after I opened the screen door, Tiger was grooming on Linda. Of course, it turned out that Tiger was the key to the success of their relationship more than I was. Female kitties fell in love with him at first sight. 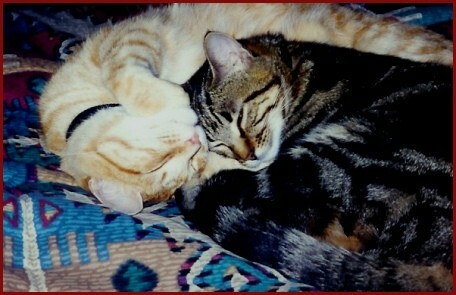 Tiger and Linda would be close friends until Tiger passed away fourteen years later. Notice how Linda's tail was bend forward and how it had a broken tip on the end. It was like that her entire life - I found it endearing and adorable. Not long after I got "Linda", my friend Linda came in town for a vist. She got to hang out with me and Tiger and the new kitty that was named after her. 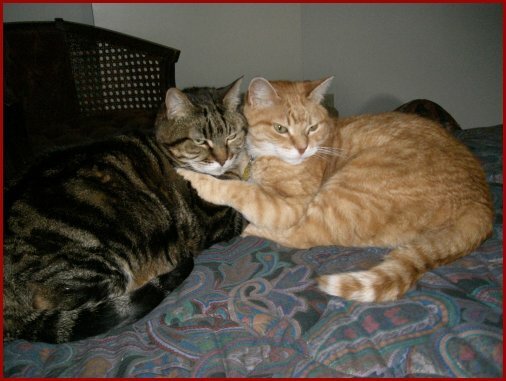 Tiger (orange tabby) and Linda (gray tabby) were lifelong friends. When I first got Linda, she was not very afraid of people - she'd even get in a stranger's lap. But over the years she became very scared of strangers. Perhaps a few visits to the vet's office made her afraid of people. I quickly became the only person that wouldn't cause Linda to hide under my bed. But my friend Nancy started slowly winning Linda over and we were pleasantly surprised when Linda finally got up the nerve to get in Nancy's lap for this picture. 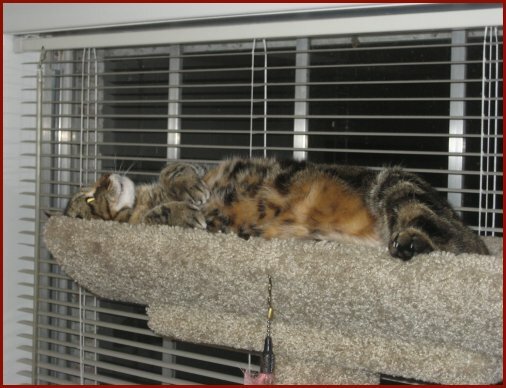 After my office cat, Sali, died in 2006 I brought Sali's tall carpeted cat tower to my house. Linda loved luxuriating on the top perch. About a month after this photo was taken I took in a stray kitten and named her Josie. Josie was a very playful kitten and would try to play with Linda anytime Linda climbed on Sali's old cat tower. So after I got Josie, Linda stopped getting on the top shelf - but she still got on some of the mid-level perches quite a bit. Especially when the morning sun shined on them through the nearby window. 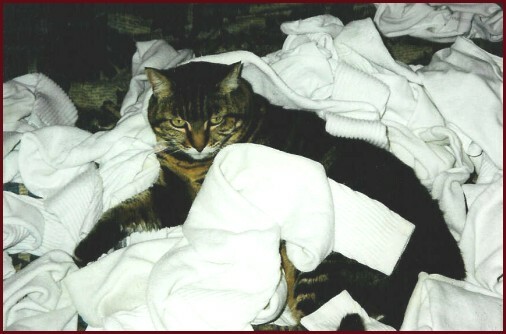 Linda loved laying on my warm clothes after they had come out of the dryer. Because I couldn't resist petting her there, it probably took me twice as long to fold my clothes as it normally would have - but I sure didn't mind! 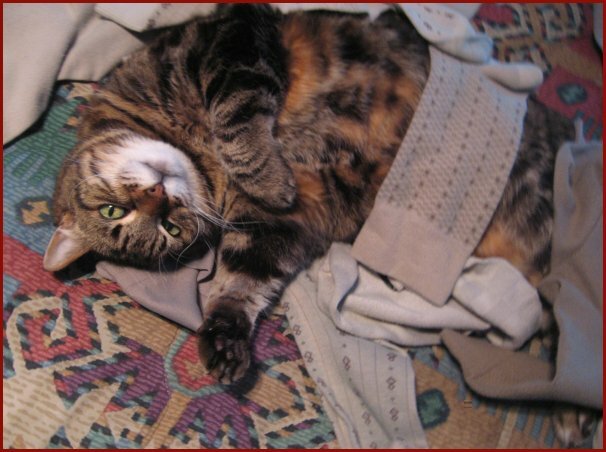 When this picture was taken she had been diagnosed with chronic renal failure for a month. She was slowly losing weight, but she behaved quite normally. She was affectionate and loving and did all our normal routines. About a month later she practially stopped eating though. That's when we discovered the large amounts of fluid filling her chest and abdomen. The vets and radiologists determined that lymphoma was causing it. Despite our best efforts, her health and quality of life quickly diminished. 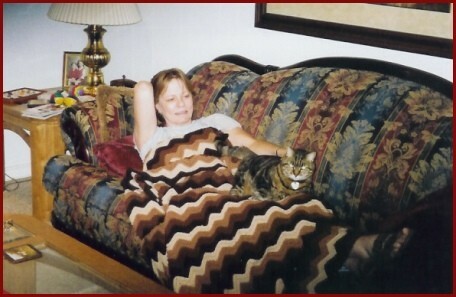 Linda was a beautiful and affectionate cat who was always willing to show me how much she loved and trusted me. I will always miss her. A little over a year before her death, Linda had begun slowly losing weight. Interestingly, this started occurring roughly when her best friend, Tiger, died after a lenghthy battle with heart failure. I'm sure Linda was missing him. The vet did some tests and concluded that Linda had Chronic Renal Failure. I was hoping I could manage the renal failure for months if not years. But it was difficult to get Linda to eat foods that were healthy for the kidneys - after all, she had pretty much stopped eating her dry food which was not good for kidneys. Amazingly, Linda appeared to feel fine - she was affectionate and behaved normally. But while I was in the process of slowly introducing new foods to her, Linda's appetite suddenly became much worse. She wasn't even very interested in her favorite food on the planet, moist Fancy Feast. I took her to my vet, Dr. Fling. Dr. Fling is one of the best diagnostician vets in the state. An ultra sound of Linda's kidneys showed fluid in the abdomen. When I heard that I suggested they do a second ultra sound of Linda's chest & heart too. The ultra sounds were pretty easy on Linda, she did not have to be put under, so we might as well get as much info while Linda was at the clinic. Sure enough, the second ultra sound showed large amounts of fluid (a.k.a. pleural effusion) squeezing Linda's lungs. Dr. Fling found this very distrubing. It's rare to have both the abdominal cavity and chest cavity filled with fluid. Not even most injuries (say, if Linda fell off the catwalks in my house) would do that. Further more, Linda's heart was pumping find, so the fluid was not cardiac related. Unfortunately, that meant that Lasix would not work well to remove the fluid. Linda's kidney numbers had worsened anyway, and Lasiz are very hard on kidneys. So Dr. Fling gassed Linda and carefully removed the fluid via a needle. She was shocked at how much she got - especailly from the chest. Over the next week we had to manually remove fluid from Linda's lungs three times!! The fluid would come back within 48 hours and make Linda feel very lethargic and unwilling to eat. She never gasped for air, but her breathing became distrubingly labored. Each time the vets would withdraw fluid, they got more and more out - often around 250ml (i.e. half a pound) which is quite a lot for a small cat's chest. So whatever was causing the fluid buildup was getting worse not better. Meanwhile, the experts - including veterinarians. pathologists and radiologists - had analyzed Linda's various ultra sounds and x-rays and fluids and determined that she had some form of lymphoma. The radiologists noticed several organs that had "diffuse changes" indicative of cancer. Linda was now too weak to do a full biopsy to determine the exact type of lymphoma, but it was becoming increasing clear that it was an aggressive form. As a long-shot, I asked to try a low-dose chemo pill (that had no nauseous side effects) and prednisone. That combination sometimes helps kitties if the lymphoma is the more-treatable kind. I decided not to put Linda through a fourth chest drainage (they have to anesthetize her for those), and to hope that the chemo/prednisone would help. Unfortunately, it didn't help. Over the next several days Linda became so weak (from not eating and from lung compression) that she could barely walk five feet to a nearby water bowl. And when she made it to the bowl, she'd flop on her side and breath fairly heavily while trying to dip her tongue into the water. It was heartbreaking. I finally came to the grim conclusion that Linda did indeed have some form of aggressive lymphoma which was going to continuously compress her little lungs with fluid and do other forms of damage to her. And on top of the lymphoma/lung issues, Linda was also in renal failure, had high blood bressure that was off the chart, was anemic and was not eating. She had not shown too many outward signs of health issues (except slow weight loss) until her final 2 weeks, but clearly, she was in big trouble. I spent practically all of Linda's final weekend with her in my guest bedroom - often under blankets on the floor. By Sunday morning it was pretty clear that she was still going downhill. She never gasped for air throughout this ordeal, but her breaths were more labored than before, and she was not even willing to lick her favorite foods. I was going to put her down that day, but at the last minute I changed my mind. I waited another 24 hours - hoping to see improvement. Unfortunately the next morning, Monday morning, her lethargy and labored breathing were even worse. She refused my offers of her two favorite flavors of Fancy Feast. She wouldn't even lick them. It was very tough knowing that her little chest was filling up with lymphoma-caused fluid with each passing second. That fluid turned a chronic problem (renal failure) into a very critical one (not breathing well from lymphoma-induced pleureal effusion). Bless her heart!! I sadly put her down that day. I sure miss that beautiful gal. We had so many warm and well-established habits together. And while I know she had several health issues, the outward signs of her bad health did't really appear so starkly until the last two weeks of her life. And then she went downhill pretty fast. I guess that should be expected with lung compression issues and anorexia. But still, it felt so fast. 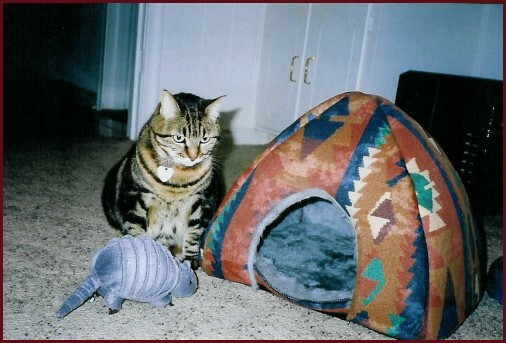 It's hard to believe that Tiger and Linda, my first two kitties, are now gone. As my friend Nancy always said of them - they truly were story book cats.